March has been an exciting and busy month for T-Ports! Lucky Bay port construction underway! This is an exciting step in the project’s timeline and signals the project is on track to deliver its goal of bringing the port closer to the product. Heavy machinery is at work for the remediation and ground improvement scopes at the site. Local concrete supplier Turners Readymixed Concrete are supplying the concrete for Keller, who will pour more than 1000 concrete columns into the ground at a rate of 100 columns per day. These will provide a solid platform for the large silo bases. More equipment will move in for the concrete and structural steel works in the weeks to follow. The many years of work that have gone into the project are now beginning to come to fruition in a really visible way in coming months. Lock farmer Caroline Longmire is pictured tipping the first load onto the port site for ground improvement tasks. 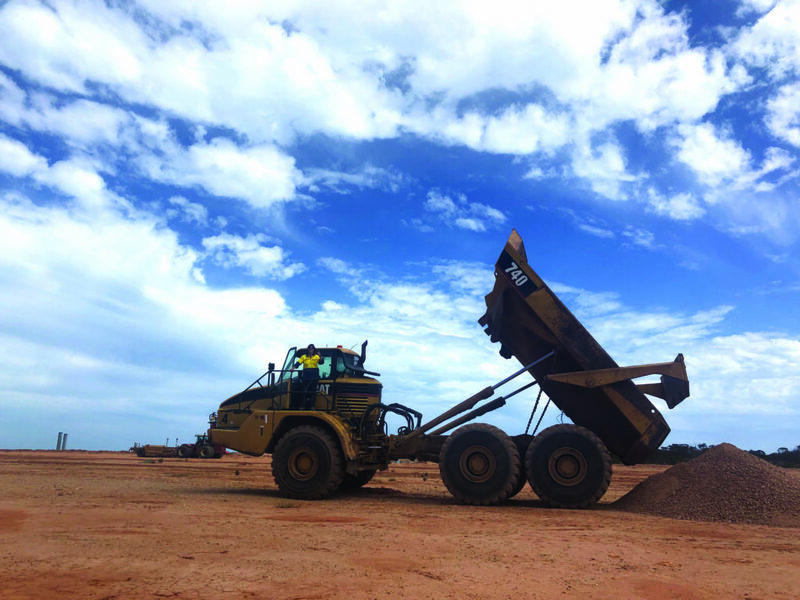 Keenly following the project from the beginning with construction at the Lock bunker site neighbouring her farm, Caroline is now working with Buttrose Earthmovers on the port construction at Lucky Bay. T-Ports is a proudly South Australian company and committed to supporting South Australian businesses and regional communities. We’ve hired local companies like Lienert Engineering, Lucas Total Contract Solutions, Ahrens, Kilic Engineering and Buttrose Earthmovers in construction along with local carriers freighting materials. We are on track to be open and ready for grain deliveries in October this year and look forward to a long and productive relationship with growers on the Eyre Peninsula. We see a long and beneficial partnership with EP communities and we know this development will provide grain growers in the region the competition in the supply chain they have been waiting a long time for. The haul road at Lucky Bay which runs between the bunker site and the port site is close to complete. The final stage – laying and compacting the top layer of rubble – will be complete during April. The bunker walls are currently being constructed and will also be complete in the next month. There is almost 7km of bunker walls being erected at the Lucky Bay site alone! The bunker wall construction is now complete at the Lock bunker site. A total of 3km was installed. Services related to power and water have been partially installed at the bunker sites. SA Power Networks is expected to connect the mains power within a month at both bunker sites. Weighbridges have now been calibrated and and truck sampling probe automation is currently being installed. Staff toilet blocks and lunchrooms will be delivered in early April. Workshops have been fully installed at both sites. T-Ports will begin a recruitment drive in coming months to ensure sites are staffed for the 2019 harvest. More information will be available on the T-Ports website. This email update was sent to subscribers on 26 March 2019. To subscribe, head to the Contacts page.